A team of University of Plymouth students have triumphed in a major international competition for their vision to create a space station that could orbit Mars. 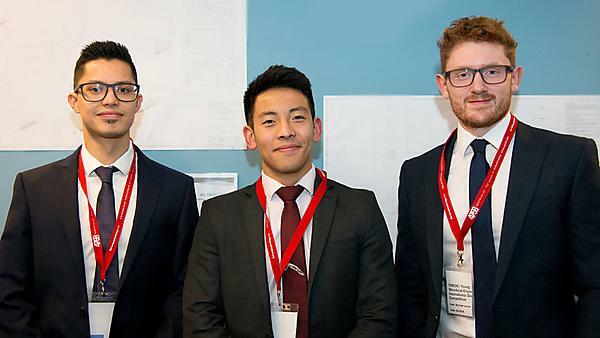 Ajen Limbu, Elliot Tam and Jack Orme, all in the final year of an MEng Civil Engineering course, won the undergraduate section of the Institution of Structural Engineers’ Young Structural Engineers International Design Competition. Entrants were asked to design a modular construction space station that could be assembled in zero gravity conditions and act as a staging post for exploration of the planets of our solar system. It needed to have the capacity to develop its own gravity field, accommodate the servicing and launching of landing vehicles and support a permanent crew of 10 with additional accommodation for 10 other visiting crew members and engineers. The three Plymouth students created the ISV Drake SR-1, named after Sir Francis Drake, having conducted extensive research into spacecraft design using material from NASA and the Japan Aerospace Exploration Agency. As well as a detailed report giving a structural overview and space worthiness, they also created section drawings of their proposed craft’s docking connection, elevation controls and module specifications. “The aerospace industry has made tremendous leaps recently, with the successful launch and landing of the Falcon Heavy. As engineers, when we see innovation through the achievements of remarkable companies such as SpaceX, we see possibilities of what we can accomplish in the present and future. This competition provided an extremely exciting opportunity for us to fulfil our sense of wonder and appreciation for aerospace engineering. Although aerospace design is not part of our curriculum, we were still able to use our engineering mind-set to understand and figure out problems encompassing the space station design. The Young Structural Engineers International Design Competition is a chance for young structural engineers to be adventurous, and encourages young engineers to develop their ingenuity, imagination and inventiveness. It is run every three years by the institution’s Educational Trust, and was judged by a panel that includes specialists in the field covered by the competition and Directors of the Educational Trust. The Undergraduate Prize is awarded to the best entry submitted by undergraduates studying a civil or structural engineering course, with the winners receiving £2,000 in prize money and a certificate. Specialised modules facilitate research and manufacture tools or components for both station and planet-side operations until a self-sustaining colony is established. 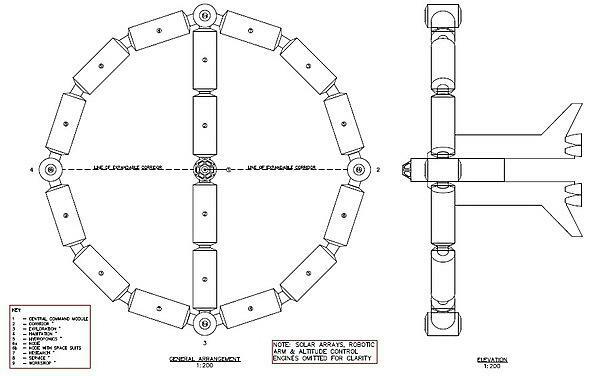 The command module is situated within the centre while corridor modules will provide a pathway into the modules in the circumference of the circle. The modules will be designed to withstand launch, construction and orbital loads, and will have a 200mm aluminium alloy shell thickness and exposed areas will further be covered in kevlar and nextel to provide a debris protection blanket. Exterior metals will be anodized to ensure thermal efficiency, and the space station will be insulated using multi-layer insulation, which is comprised of mylar and dacron. An active thermal control system will be used to transfer heat and energy away from the wires in the space station to the outside utilising liquid-heat exchange systems and radiators. Wiring within the space station will have silicon insulation for fire risk reduction and power is generated utilising solar panels that extend from the central command module and the exterior modules. Gain the skills and knowledge needed to play a key role in design, creation and maintenance of the vital infrastructures that support lives in our increasingly populated and changing world.